As a little girl, getting the Christmas decorations down from the attic was a momentous occasion to me—I’ve always been a girl who loves to make things pretty and festive. And since becoming Episcopalian, the way I bring the season into my home has become even more fun and meaningful; it’s an occasion to share my faith through things I love, and to make my home into a place of comfort, joy, and celebration. And while I do love santas and snowmen and my Christmas tree, there are a few core components that I especially focus on when it comes to bringing Advent and Christmas into my home. Last month I did a post on ideas for creating your own Advent wreath, which is something you can really have fun with. And even though now we’re half way into the season, jump in! Advent is the season of preparation as well as waiting–so cut yourself some slack and join in the festivities. A nativity, or crèche, is just as important as the Advent wreath, and sometimes you can combine the two by placing your nativity in or around your wreath. The Nativity can be a gorgeous heirloom ceramic masterpiece high on your mantle, or it can be gathered lego people and stuffed animals. The endless fun to the nativity is that it can be tailored to your home style and tastes. This year we are using a wooden candle ring as our advent wreath and using a small wooden Nativity set I found at an estate sale. Since I’ve got a toddler at home, my decorating theme is ‘things that can be hurled across the room and not break,’ so we’re really into durable décor at this time in life. An unexpected bonus to this has been that my kids are really interested in the nativity and my son loves to play with it–sending the wise men across the table on their journey, and lining up all the animals in a procession. Because the figures aren’t too precious or breakable, they’ve become interactive, and it’s something I love to watch. You can learn how much your child is taking in from what they see around them by watching them play. And it can be heart warming, and hilarious at the same time. Within Advent there are so many great feast days to celebrate, and great opportunities to create meaningful traditions for your own family. Some of our favorites are St. Nicholas Day on December 6 and St. Lucia Day on December 13. 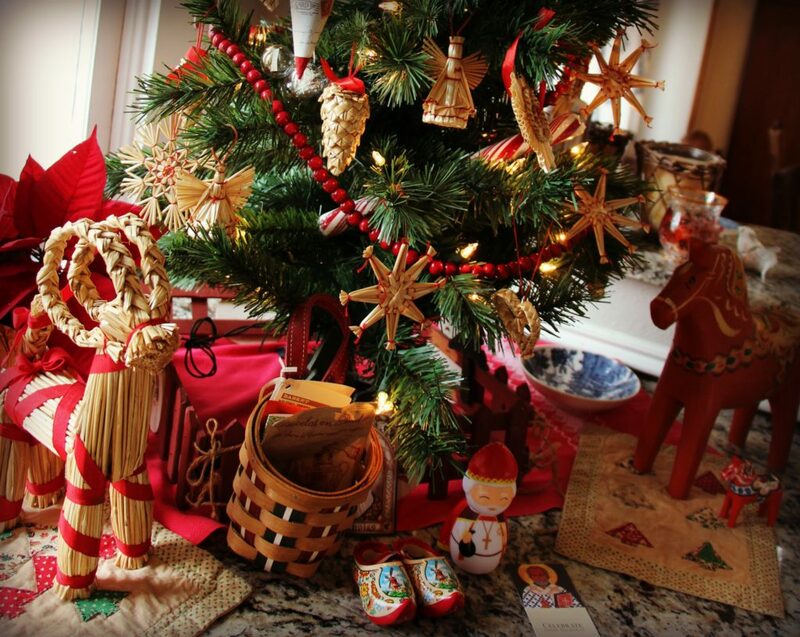 Old fashioned decorations or traditions that coincide with these special days include shoes left out and filled with gold coins or Clementine oranges for St. Nicholas Day and straw ornaments and animals, dala horses, and sheaves of wheat for St. Lucia Day. 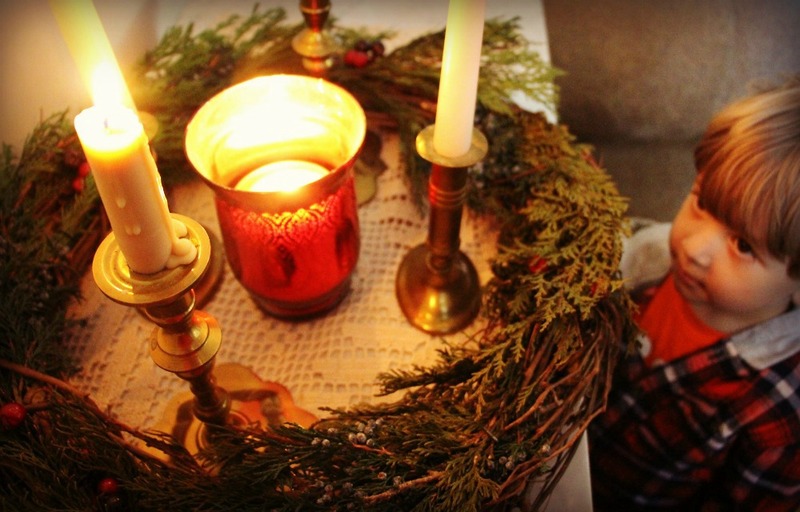 Not only does observing these smaller feasts within Advent give you more opportunities to celebrate, but they can get you in touch with your ancestry and simpler things to focus on instead of the holiday rush. Both these feasts days are very popular in European countries, especially Germany and Scandinavia. If your family background is Hispanic, a wonderful feast day to observe is the feast of Our Lady of Guadalupe on December 12. Some celebrate this special feast day by displaying the icon of Our Lady of Guadalupe, perhaps surrounded with Poinsettias, which are native to Mexico. And speaking of poinsettias–flowers can also be a lovely element to add to your Christmas décor, especially if you’re a garden lover. Poinsettias have a sweet Christmas legend attached to them, which takes place in Mexico. According to the legend, a poor peasant girl was on her way to church on Christmas Eve and wanted to give a gift to the Christ Child in the nativity. She had nothing of her own to give, and had to gather weeds she found on the roadside on the way to church. As she brought the weeds in and humbly offered them, the weeds suddenly burst into brilliant bloom. And that is why the flowers we call “The Poinsettia” is known as ‘Flores de Noche Buena’ or “Flowers of the Holy Night” in Mexico and Central America. One word of caution about poinsettias though–they can be poisonous to pets, so use them wisely. In my house full of kids and animals, I prefer to decorate with forced bulbs such as paper whites (narcissus) and amaryllis. 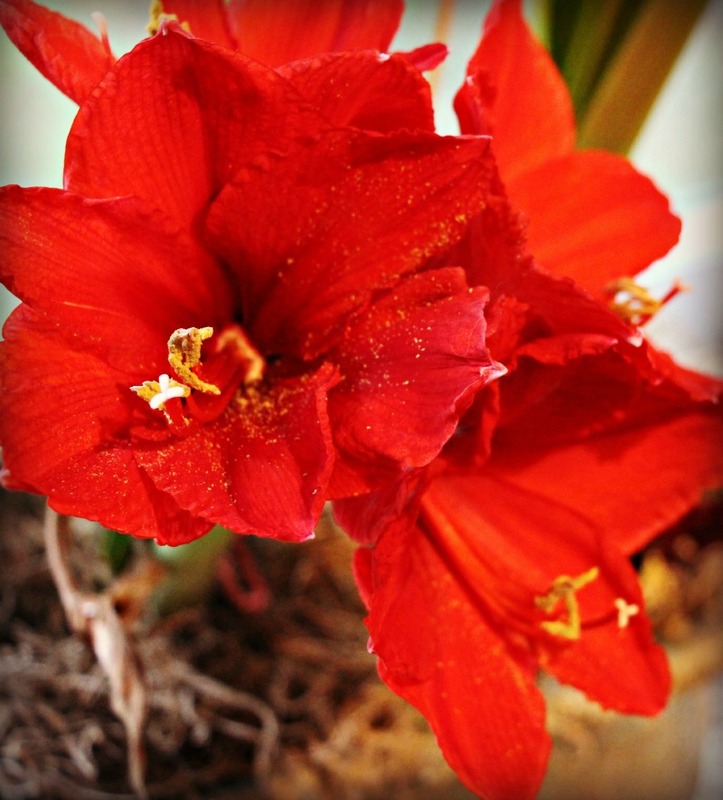 These bulbs can be ‘forced’ to bloom indoors, and unlike some bulbs that need to be stored in the refrigerator to think they’ve gone through winter, paper whites and amaryllis bulbs can be planted and begin to grow within days. How you plant these winter blooms is half the fun—- they can be potted in bowls or baskets, tea pots or jars. There is something so nice about seeing something grow and bloom in the dark of winter. And it is a small reminder of the coming Lenten season, of rebirth and life that will be coming in just a few months. And in this season of anticipation and waiting, there will be lots of opportunities to have kids get into decorating and creating beautiful things to display around the house. Some of our favorites include simply paper snowflakes cut out of white typing paper. You can tape them to the windows or suspend them from a light fixture; for not a lot of fuss or money kids can come up with a beautiful snowstorm to brighten up the house. 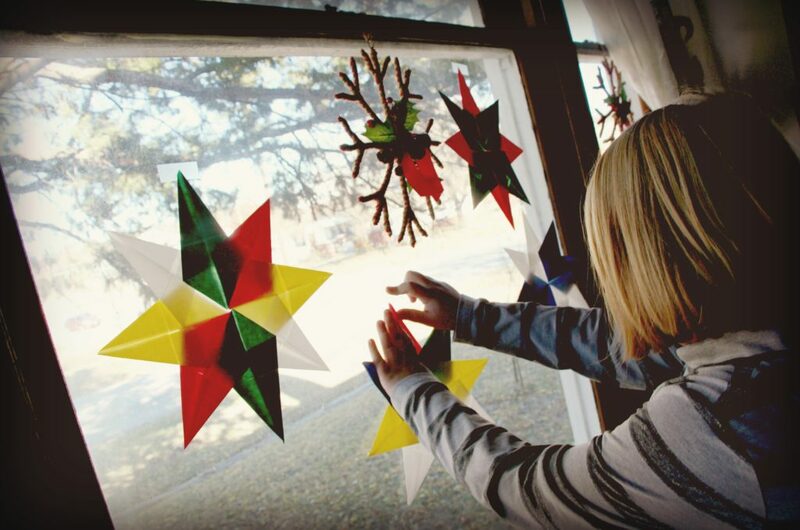 Something new my family has been doing is making Waldorf style wax paper stars that we put in the windows. They are similar to snowflakes but can be done in a rainbow of color, and can lend themselves very nicely to a story about the star of Bethlehem. 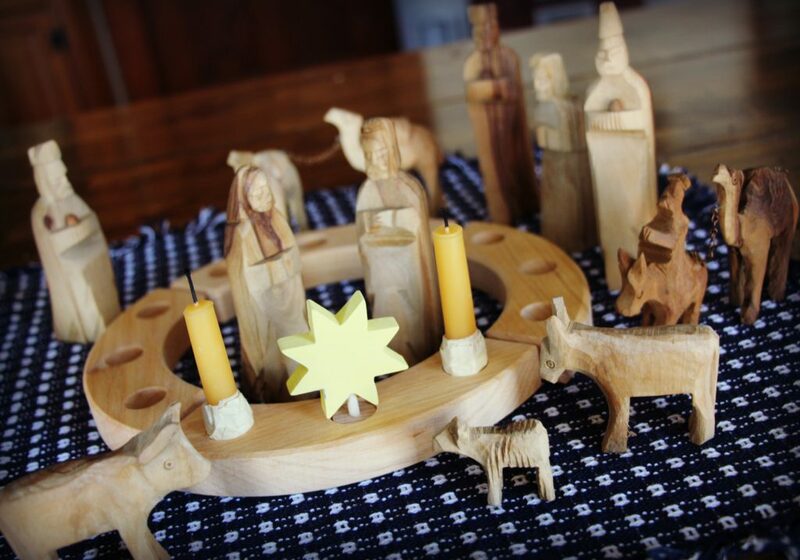 Perhaps you can display your stars near your nativity and Advent ring, and tie the whole thing together! Or just keep making stars because they’re lovely and fun and add beauty. Sometimes that’s all the reason you need! Or just search ‘Waldorf stars’ on YouTube and get lots of great ideas and instructions. Advent is such a lovely season. And it can be so beautifully celebrated within the home. The trick, to me, is to concentrate on the meaningful; do what you feel inspired to do, and when you are inspired to do it. Decorating your home is meant to be fun and something that gives you pleasure–it is not the reason for the season; but it can be a wonderful aid for savoring Advent. There is just something so heartwarming about candle light, a sweet nativity or a window full of stars. If these sorts of things make your heart go pitter pat, enjoy them! Let them compliment your faith, and enjoy them to the very last drop! The Episcopalian tradition is to continue celebrating Christmas all the way through Epiphany, on January 6. So if you’re feeling a little behind, no worries! 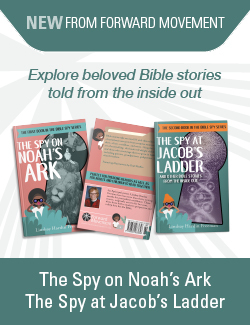 It’s never too late to delve into the season of wonder and joy! What is your favorite way to decorate for the season? Excellent article, full of great ideas for families. Thanks for sharing! I light my Advent wreath each Sunday and begin to set up my crèche. On Advent I, I displsy the crèche with stars. Advent II the animals are added; Advent III the kings begin their journey and angels are placed throughout; Advent IV shepherds arrive. Christmas Eve, the Holy Family is added. Throughout the Christmas season, the kings move closer, arriving on Epiphany. My family has found this a meaningful way to keep these hectic seasons.